End-of-year awards tend to be impersonal and predictable, so we've left it open to our contributors to interpret the question: what are the best and the worst cars you've driven this year? Let's see what we get. Feel free to add your own to the list. I thought I'd kick off this year's retrospective as I've probably driven a wider variety of cars in the last 11 months than at any point in my life. A lot of them were your typical new cars which are rarely anyone's favorites, but I appreciate when an automaker can make their appliances a little more interesting. It's harder to make a good crossover than a good supercar, so even though I've driven a number of more exotic luxury vehicles I'm only placing one on my list this year. Here are the cars I loved, the cars I loathed, and the reasons why. You should take car buying advice from people who have owned more cars than any human being logically should, so if you don't trust me (although I've owned a 240, a W123 and now a Merkur) you should listen to Jamie Kitman. He owns one of everything. Earlier this year he made the point that we should buy Mazda products because Mazda makes the cars we all ask for and can actually afford. Cars that put a premium on design, handling, and engineering. He was talking largely about the new Mazda3, which has always been a great car. I'm going to add the Mazda CX-5 to this list. Yes, the Ford Escape offers a better interior and more powerful engines, but the CX-5 is ultimately a better car. There's no other crossover in this space that offers the dynamic handling, the fuel efficiency, and the thoughtfulness of the CX-5. I don't generally like crossovers, but I love the CX-5 for being the vehicle we were promised when they started to ditch wagons and hatchbacks. It also has the best manual gearbox of just about anything I've driven this year. That's right. A car that costs less than $25,000 spanks those fancy short-throw boxes. It's smooth, crisp, and entirely intuitive. Want to learn how to drive a stick? Buy a CX-5. Hollywood tells us that after dating numerous supermodel hotties the prospect of dating another one becomes unappealing and thus the handsome guy or fetching woman decides to date the normal person who, lo and behold, turns out to be secretly hot underneath. So it could be with Porsche. There's no such thing as a bad Porsche, making it easy to get a little complacent about the brand. In my life I've driven four different 911s, three different Cayennes, and a couple of Panameras. They're all fantastic. I drove an older Porsche 928 GTS this year. Also amazing. 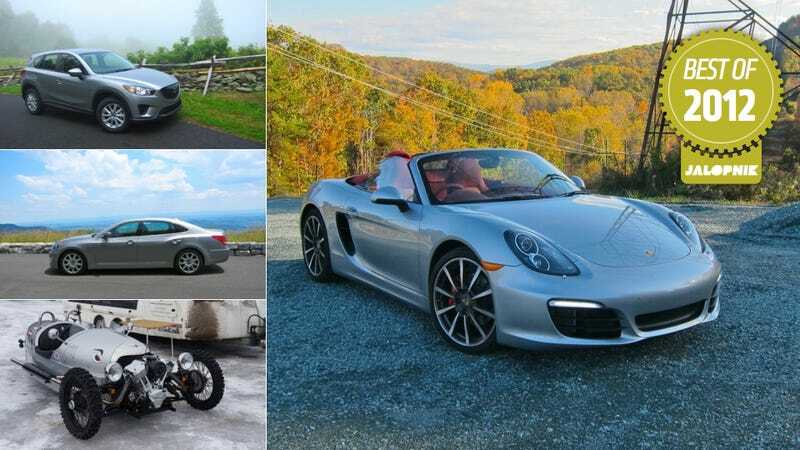 Therefore I should have been unenthusiastic about the new Porsche Boxster S, another iteration of the entry-level-yet-still-pricey roadster with hand-me-down looks. I should be more excited about the Genesis Coupe, says Hollywood. I'm not. There's a reason why the actors in these movies are married to supermodel hotties in real life. They're fun and gorgeous. Is there a more attractive new car profile? Doubtful. The Boxster still has hand-me-down looks, but they're hand-me-down from the Carrera GT not the 911. Performance-wise there's little that I drove this year that made me feel faster, even if it isn't the fastest car I've driven all year. Its stupendous grip and Scaletrix-like handling meant that I reached my limits before the car did. And the sounds! If Barry White was an impact wrench, and that impact wrench was capable of making love, this is roughly what it would sound like. The Morgan 3 Wheeler was the only car that broke on me within the first two hours. In fact, I spent more time fixing it than driving it. That makes it, without a doubt, one of the best cars I've driven. You can't put a price tag on unpredictability. It rides like a wheelbarrow and steers like a combine but you can feel every pebble in the road. It is the antithesis of most modern cars, which generally feel like screwing a couch cushion through three layers of Trojans… or so I've heard. With the loud S&S V-twin mounted on the front everyone stops to look and, because you're out in the open, they also often walk right up to you to say hello. It is the ultimate conversation starter and for $35,000 you'd be wasting your money buying a Ferrari or a Bugatti or any other supercars merely for their look-at-me-potential. Saturday nights at Golden Corral are "Steak & Steak" nights, offering patrons all the steak they can eat at budget prices. The basic premise behind eating as much low quality steak as your bowels can hold before erupting is roughly the same one behind the Hyundai Equus. No car offers more executive features for a lower price. Sit in the back of one and you'll be treated to a pop-up DVD player with a reclining massage seat and a small refrigerator. If you are the trade ambassador for South Korea there's really nothing else to buy if you want to feel important, because your status and position won't let you. If you're not an executive or representative for South Korea there's absolutely no reason to buy this car. All of the features are there but they're all the cheapest version of that feature they could get away with. The wood trim is too shiny, the electronics too outdated, and the leather and plastics are outclassed by what you can get in most economy cars. Hyundai has done much to gain market share in the U.S. and has demonstrated an understanding of how we Americans work. On this, they've failed. You can buy a Hyundai Genesis R-Spec sedan and get basically the same car, just shorter and better in almost every way. I quite like the Genesis R-Spec. Yes, it only costs $65,000, but there's a reason. To quote Andy Dwyer: "I'm allergic to sushi. Anytime I eat more than like 80 sushis I throw up." I love Jason and the way Jason loves cars and was looking forward to driving his vintage Volkswagen Beetle he's had since he was 18. Scooting around town in the back of it with TopGear's Matt Jones made me appreciate the joys of simple earnest motoring. Then I asked if I could drive the thing. Jason, politely, acquiesced to a short trip. Old cars, like old people, have quirks. Familiarity has made Jason unperturbed by some basic problems with his daily mode of transportation. For instance, you have to clutch-in whenever you stop lest the car completely stall. You don't shift the car so much as jam gears in the hope of finding the right one. Steering the car is like wrestling with a very skinny, very round midget who doesn't like you. It took me five hilarious minutes to just get the car out of a parking spot. I get that old cars are not as cushy and over-boosted as our modern vehicles, but I just drove an '80s Euro Ford with a welded diff for 560 miles and felt much safer. What's astounding is when Jason drove it the car seemed fine, like he didn't even notice the parts falling off when Jones tried to open the window. Terrible car for me, great car for him. I actually probably love Jason more for driving it.